I was flipping around the news channels this morning when I saw a brief book review (basically a thinly veiled advertisement) for a book called Mai romani decit romanii? and it made me smile. All the orthography issues aside, I’m sure it’s a great book. I’m linking to it as a courtesy and definitely not because I’m featured in the book, even though the title is “More Romanian than Romanians” and my blog has had “I’m More Romanian Than You!” on the sidebar since day freaking one. Ms. Pralong, to her credit, certainly invited me to be included in the book. She sent me several nice emails and even called me on the telephone to try to convince me to be in the book. But I turned her down every time even though she seemed to be a very nice lady precisely because I abhor the entire concept. Let me be specific – I asked some very hard questions about the profits from the book and the the long and short of it is that they go first to the publisher (obviously) and then the “coordinator”, which is Ms. Pralong (who is also selling the book online in digital format via other channels), and none go to the people featured in the book (i.e. Raed Arafat, Pamela Ratiu, etc). Which might be fine if these people were interviewed and Ms. Pralong had to put in some work typing them up (or something) but the format that Ms. Pralong chose was that the people featured in the book wrote their own pieces themselves. So me writing an essay about myself and why I love Romania and making virtually no money is what I already do right here on this here blog LOL. Doing it so that someone else can make a profit just seemed ridiculous, so I declined to participate. No hard feelings though as I’m sure everyone else is enjoying the attention. Also, of course, as you can see (if you clicked on the links above), the entire book was “moderated” by none other than Alison Click! Mutler. What’s easier than writing a book yourself? Getting other people to write it for you! You are a fascinating person, Sam! Well done for not giving her free content. 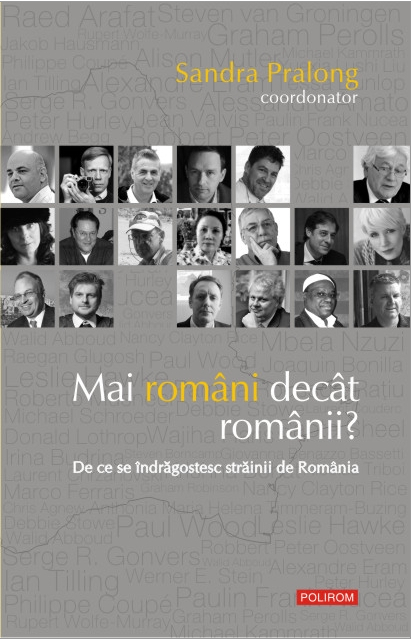 And thanks for spreading the word about this book, it’s a useful book for romanians, might help a bit with the inferiority complex. I really don’t understand this complex. I keep hearing about it and I can see nothing of it. What I mean to say is every individual I’ve meet in real life and in the virtual world has nothing to feel inferior about. I worked side by side with a Romanian woman here in the USA for a year. Her English was on par with any American and her grammar is better than most Americans I know. Her reasoning/critical thinking skills were good. Often we debated topics at lunch and she would have me “on the ropes.” She is fiercely proud of her country and well, she is just an all rounder. The second person I know has immigrated here to the USA. She too is extremely smart. Her English is suburb. She is just as smart and articulate as my former co-worker. I know several talented and smart people from Romania on FB. I don’t get were this inferiority complex attitude originates. Though my wife likes to say I’ve romanticized Romanians, I am sure they, like any society, have a similar cross section of talented individuals. I read about the problems they have in general with the government. I’ve experienced directly some of the wickedness which exists in Romania in the form of stolen mail. Why would such a bright and smart group of people allow such things to continue? I hope continuously for Romania. This place and people are always in my heart. Peace.